For the treatment of mild to moderate pain including headache, migraine, dental pain, sore throat, period pains, nerve pain, aches and pains including muscle pains and backache. Symptomatic relief of rheumatic aches and pains, flu, feverishness, feverish colds. For short term use to reduce fever in colds and flu in adults. For oral use. Dose, unless otherwise directed by your doctor. Adults and Children over 12 years: One to two capsules (500mg to 1g) to be taken orally with water. Maximum dose: Eight capsules (4g) in any 24 hour period in divided doses. The dose should not be taken more frequently than every hour hours and not more than four times in any 24 hour period. Do not take for more than three days without consulting your doctor. Children under 12 years: Do not give to children under 12 years of age except on the advice of your doctor. Do not take more medicine that the label tells you to. 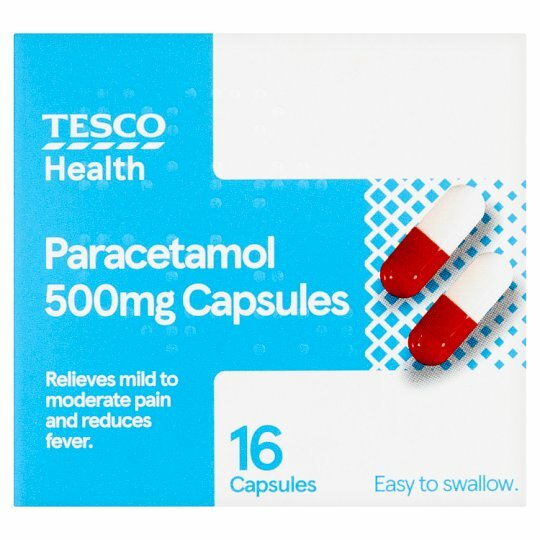 If you do not get better, talk to your doctor., Do not take anything else containing paracetamol while taking this medicine., Talk to a doctor at once if you take too much of this medicine, even if you feel well., Keep out of the reach and sight of children.